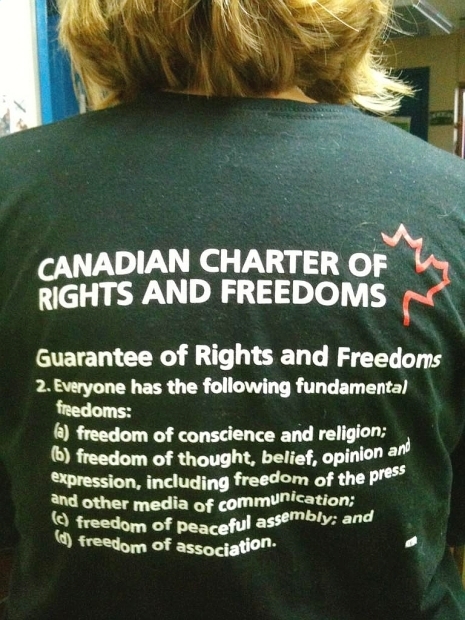 Vancouver Sun, Zoe McKnight, February 4, 2013 — The British Columbia Civil Liberties Association is accusing the Prince Rupert school board of infringing on teachers’ freedom of speech by banning the wearing of t-shirts printed with those exact Charter rights. 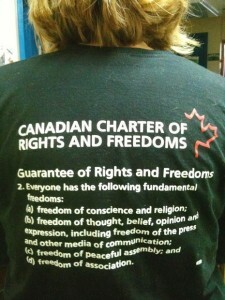 Three teachers in School District 52 were told last Monday to remove or cover their black t-shirts emblazoned with wording from Section 2 of the Canadian Charter of Rights, which includes the right to freedom of conscience and religion, freedom of thought and expression, freedom of peaceful assembly and freedom of association. “The school district’s decision to ban free speech about free speech reminds us of a badly-written comedy sketch. But this isn’t an Air Farce skit — it’s a troubling violation of teachers’ constitutional right to free expression,” BCCLA president Lindsay Lyster said, adding that schools have an obligation to encourage open discussion. In an open letter to chair Tina Last and other board members, Lyster asks the school district to rescind the ban on the t-shirts, which were part of a protest organized last week by the B.C. teachers’ union to mark the 11th anniversary of legislation stripping teachers’ rights to bargain class size and composition. The school board said the t-shirts were a form of political messaging, which is against the rules. The Atlantic, Emily Richmond, January 22, 2013 — In the wake of the Sandy Hook tragedy, lawmakers are moving quickly to respond to the public outcry to do more to ensure schools are safe. But will arming teachers — or putting an armed guard at every school in the nation, as the NRA has suggested — make a meaningful difference? Or would it actually increase the risk of harm, as some gun control advocates contend? Labor groups and associations representing the nation’s school teachers and principals have already saidthat asking educators to be prepared to respond to an armed intruder with similar firepower is an unreasonable burden. At the same time, there’s also been a reported spike in interest among some teachers who say they want to know what their options are when it comes to protecting themselves — and possibly their students — from an armed intruder on campus. For more than decade, the Utah Shooting Sports Council has offered free weapons training to teachers. The first class of the new year brought ten times the normal enrollment, the Salt Lake Tribune reported. The class covers the fundamentals of applying for a concealed weapons permit, carrying a weapon, and using it to respond to an emergency. And the training doesn’t just focus on how to respond with a gun. Teachers are also taught techniques such as “gouging an attacker’s eyes, choking an attacker and how to hide,” according to the Tribune. Utah teachers are far from the only ones expressing increased interest in concealed weapons. There has also been a jump in inquiries at gun training clinics in Florida, according to the Palm Beach Post, even though the state bans nearly all weapons at public schools. At lunch hour today, we collated and delivered, to BC Premier Clark and Minister Abbott, 400+ signatures from faculty members, librarians, administrators, students, and staff in post-secondary institutions across the province in support of BC Teachers and the BCTF. See Petition Site for more. Thank you to all who helped circulate and signed this petition! Your activism and presence make a difference. That’s powerful and resonates with the vast system of public support that is turning out for the rallies across the province. To try and govern workers– to try and suppress a labour movement that is ascendent and increasingly unified– with this might of legislation, Bill 22, is foolish. 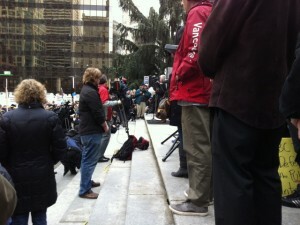 The opposition party, the NDP in BC, is doing all it can to undermine and debate this anti-democratic legislation that is Bill 22. Adrian Dix, Leader of the NDP, guaranteed the labour movement yesterday in Victoria that his party was not resting and would do everything in its power to give teachers the fair right to bargain– a right that every public or private sector union or professional association deserves.